Hatem Ben Arfa injury | NUFC Blog. 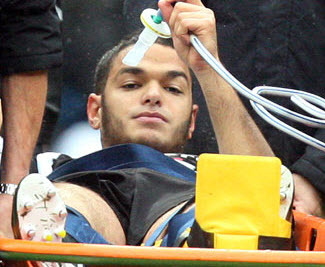 Archive for tag: Hatem Ben Arfa injury. Newcastle United’s Hatem Ben Afra receives a letter from Nigel de Jong expressing regret over last season’s tackle, which resulted in a broken tibia and fibula for Ben Arfa. Difficult to forget it really! 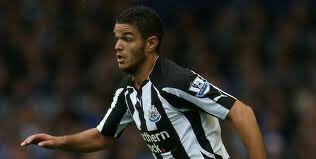 Will Ben Arfa’s return signal a different style of play for Newcastle? Newcastle United’s Hatem Ben Arfa is keen to get started with Premier League football after his appearance against Nottingham Forest in the Carling Cup on Tuesday. Alan Pardew won’t be rushing him back but could it be that the eventual return of Ben Arfa will signal a shift in the way the whole team plays? Hatem Ben Arfa has played very few minutes of first team football for Newcastle since joining the club, yet an awful lot of expectation seems to surround the lad. It’s as if he’s the missing piece to some puzzle. “All the year I worked so hard to come back and I’m very happy to be on the pitch now. I’m very happy to see the supporters again and I thank them for all the encouragement last year. I feel very good. I have confidence and I feel I will do very good things now. Alan Pardew puts paid to the idea of bringing in any free agents to plug any gaps in the Newcastle United squad, and he looks forward to the return of Hatem Ben Arfa. “I’ve no intention of bringing a free agent in. I’ll go with the group. Newcastle United manager Alan Pardew dismisses ‘whispers’ alleging that Ben Arfa will never be the same player after his broken leg. Apparently there have been ‘whispers’ that Hatem Ben Arfa will never properly recover from the double leg break inflicted upon him by Nigel de Jong. “I would dismiss that straight away. I don’t see any problem with him coming back just as good as he was. “You’re talking about a really bad break. And I think we were buoyed by his last visit because he was a lot, lot better within himself. “I think anyone who has suffered an injury like that, you’ve got to give him time, you’ve got to understand what is happening.